Healthy Addictions. It's Me, J.Marie. I never thought I'd see the day that I'd say this, but I'm in LOVE with brussel sprouts! Growing up, I've always seen kids on tv talk about how they hated them, and I've even seen pictures of them looking disgusting. However, ever since moving to New York, I've woken up from many naps to the smell of them cooking, and thinking it was cabbage, I jet downstairs ready to grab a plate. 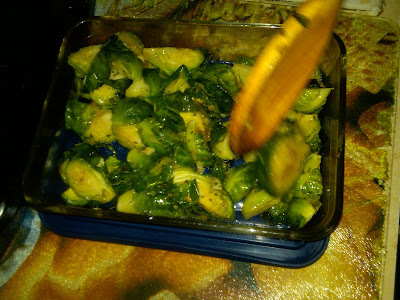 To my surprise, brussel sprouts taste similar, and the way my aunt sautees them with just enough garlic and oil makes them irresistible! I'd seriously eat them all day, every day, and thank God they're healthy! I need a healthy addiction nowadays; I'm trying to get fit/stay fit, especially with Vegas around the corner!